First the Zeppelin NT made a guest audio appearance in the Disney-Pixar movie UP. 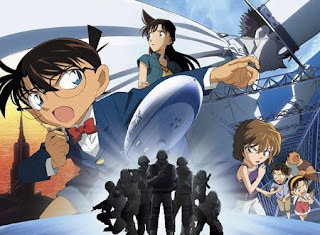 Now we hear from Hiroyuki Watanabe, our airship friend in Japan, that the NT has an on-screen role in a major Japanese animated feature, "Detective Conan: The Lost Ship in the Sky". The DVD and Blu-ray versions are slated to be released November 16. In the meantime, see this clip featuring the airship on YouTube. Be sure to watch the whole thing, as there is a mix of animation and some live action shots of ship #2 in the closing credits (about 7 minutes into the clip).